If you have natural stone, like marble or granite in your Ocala home or business, it is important to give it the preservation it deserves. These natural stones, when maintained properly, can be some of the most spectacular materials integrated into any decor. However, natural stones require maintenance that manufactured flooring does not. Natural stone flooring can last decades with proper care. But, when neglected or not restored or maintained properly, they can easily lose their natural beauty. Natural stone has significantly varying degrees of hardness and some are stronger than others, but even the hardest stones need to be cared for. For example, granite is the hardest of the most common natural stones, and yet it still needs to be maintained to keep its original luster. Following is marble and travertine, which are gradually softer stones and are each extremely vulnerable to chemical damage. Even weak acids, such as vinegar and orange juice, have the capacity to fairly rapidly scratch travertine or marble. 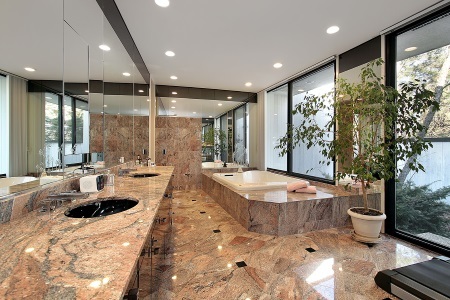 With appropriate care, natural stones such as marble, granite, and travertine can be maintained throughout the years. Without proper care, however, your aging natural stone floors and surfaces will end up scratched stained and chipped, looking very dull. OneRestore's stone and marble restoration process will return your marble floors to their brand new state, adding not only monetary value to your home but visual appeal as well. Our maintenance program for your travertine, granite, or marble will keep your floors in perfect condition with decreased chance of future damage. 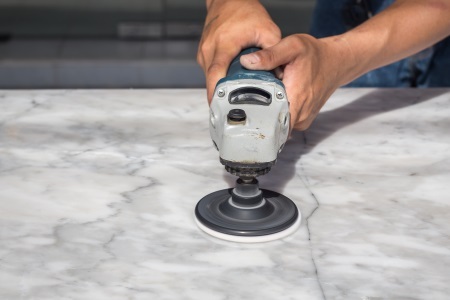 OneRestore's Ocala Marble and Granite Restoration Specialists use a variety of resin matrix diamond abrasives ranging from grit 220 to 11,000 to smooth, polish, and hone your floors. The polishing and honing steps are done with water to reduce dust, and then the slurry is vacuumed from the floor. Next, the stone is polished utilizing a polishing machine and chemical that dissolves concrete or stone and re-deposits it, filling in all the macroscopic scratches thus creating a surface that is structurally tougher, smoother, and more resistant to daily abrasion. The finishing step is to seal the concrete or stone with a penetrating sealant. Immediately following the final polish, the sealant is applied to the surface. This acts as a protection to the stone to prevent penetration of spilled materials upon instant contact. Easily maintained, a restored surface lasts last 4 to 5 times longer than if simply an acrylic finish was applied.